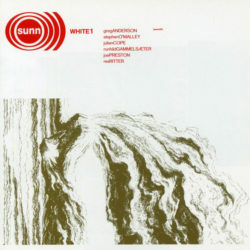 , Sunn O))) have reissued their two White albums in high fidelity vinyl format. Originally released in 2003 and 2004 respectively, White 1 and White 2 were actually conceived as acoustic albums. But as Sunn O))) co-founders Stephen O’Malley and Greg Anderson note, the outcome of the recording sessions at Oregon’s Fontanelle’s Magnetic Park studios made for two psychedelic, electronic drone experiments. The reissues will be pressed on 180 gram vinyl and include an A1 poster of portraits by Kerry O’Sullivan and Glynnis McDaris. They’re limited to 1000 copies each and can be bought via Southern Lord’s website or Bandcamp. Later on in July they’ll hit the shops in a variety of colours.